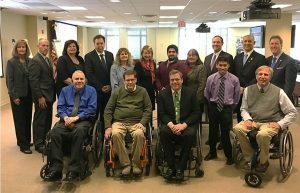 Parking experts, advocacy groups for people with disabilities, state and federal agencies, and academics have formed a coalition to address a wide range of issues. (ALEXANDRIA, Va. – December 19, 2017) According to a preview of a national survey to be released in early 2018, 96 percent of responding people with disabilities feel the ability to find parking is an important factor in leading an independent life, yet more than one-third have problems finding accessible parking on any given day. The most significant problems are created by drivers without disabilities who park illegally in accessible parking spots or obstruct access by parking too close to a vehicle, making it impossible for drivers with disabilities to exit or enter their vehicle. Many other challenges are reported. About 80 percent of respondents believe accessible parking fraud and disabled placard abuse is widespread, and even more believe law enforcement of disabled-parking regulations is inadequate or non-existent. Many individual jurisdictions and agencies have been working on their own to address the problem and many have developed innovative solutions, but this is the first time accessible parking and disabled placard abuse is being looked at on a national level by a unified group of transportation officials, government agencies, advocacy groups, parking management and technology experts, disabled veterans groups, civil rights advocates, and those in the independent living movement, among others. In addition to publication of the national survey results, one of the coalition’s first projects will be to create an online resource center that features research, news, legislative initiatives, and policies—and showcases programs that are solving the problem. A public awareness campaign is also planned. To receive updates or inquire on behalf of an organization interested in joining the Accessible Parking Coalition, contact Helen Sullivan at the International Parking Institute at sullivan@parking.org with APC in the subject line.